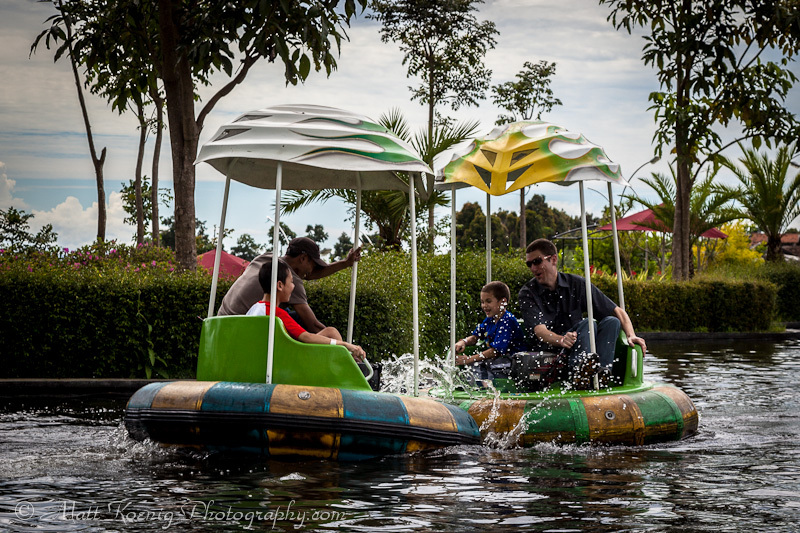 The other day we took a drive to Kampung Gajah where we spent time with the kids doing different activities at this amusement park. These are the fun things we like to do while on sabbatical. 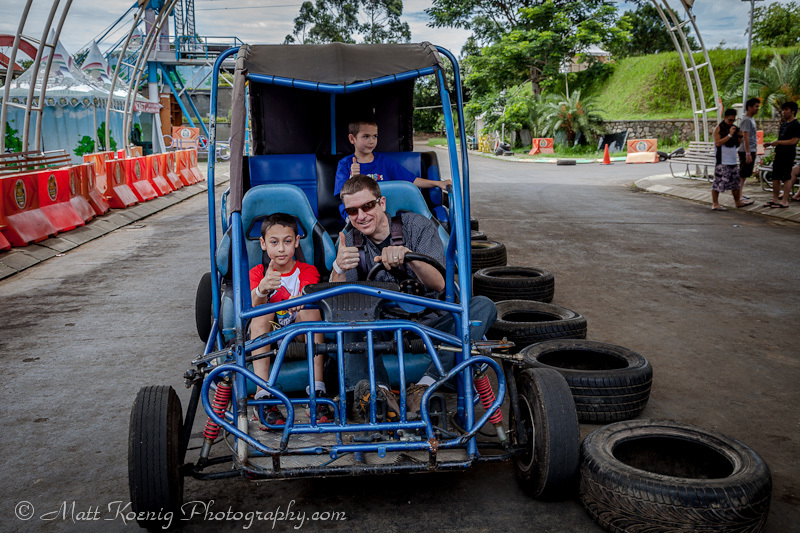 The first thing the kids wanted to do was drive these mini ATV’s. My youngest wasn’t old enough (missed it by one year) but my oldest was so he got to go around the track a few times and then drive his brother around. My son riding his first ATV. 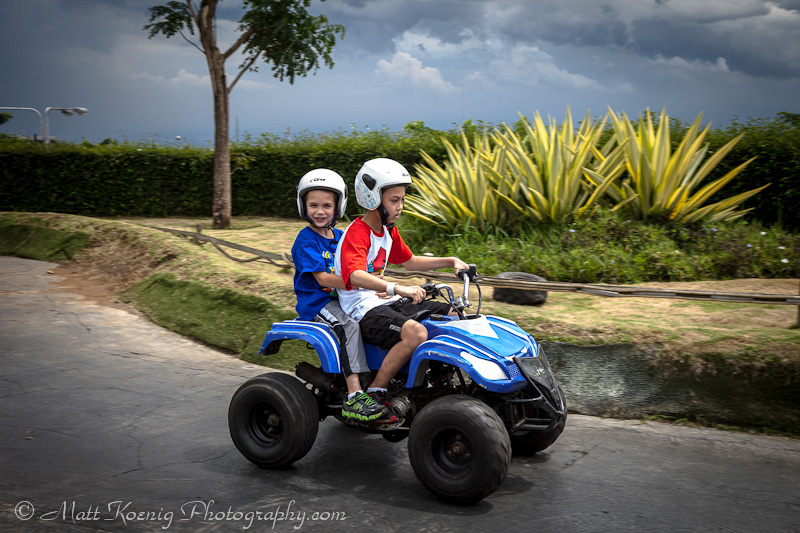 Both my boys riding an ATV at Kampung Gajah. 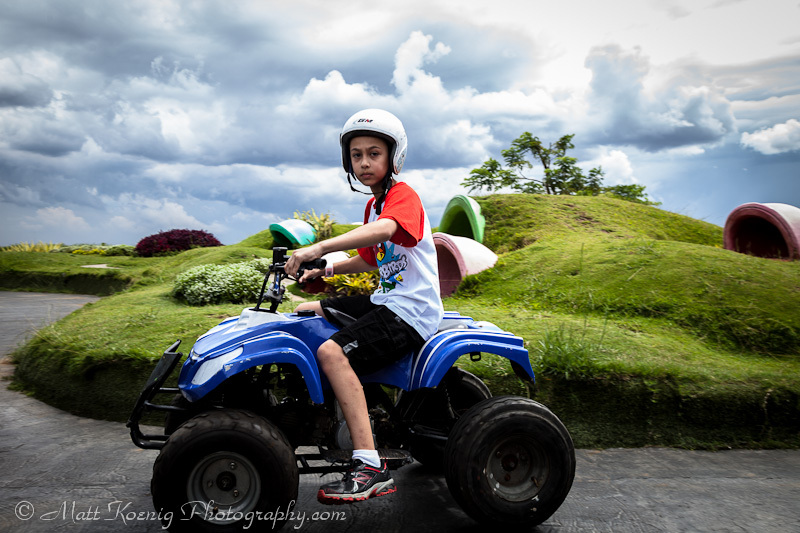 My youngest playing around at Kampung Gajah Wonderland in Bandung. Then we went over to where we could drive these buggies around a road course. It was my two boys and me on the open road and we opened her up and put that buggy to the test. We all had a blast making laps around the course. We wanted to take a turn at the tube run but unfortunately it was closed. It looked like it might be a crazy ride and reminded me of doing the tube run in the snow at Hoodoo Ski Resort in Oregon. The view from the top of the city below was nice. 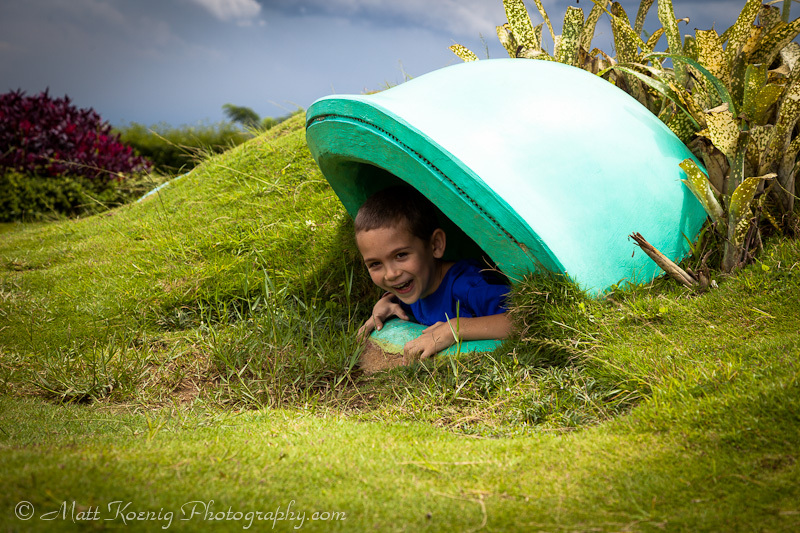 The tube run at Kampung Gajah Wonderland. It was closed but we enjoyed the view. So since the tube run was closed we decided to let out a little aggression on the bumper boats. They said the kids were too young to navigate the boats by themselves so I teamed up with my youngest son and I on one boat and one of the ride operators teamed up with my eldest son. I think they had an advantage as he knew how to adjust the speed of the motor and they were able to outmaneuver us. 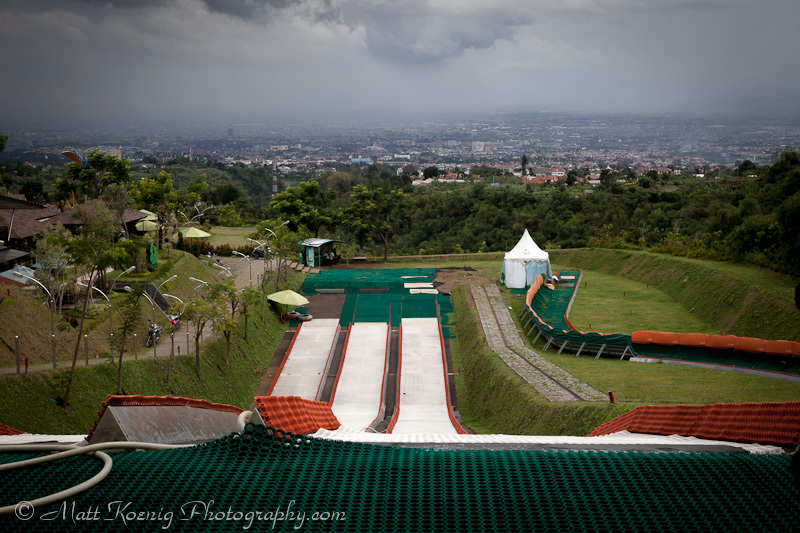 Apparently there is a really nice water park at Kampung Gajah as well, something we were not aware of or prepared for. Without swimming apparel we were not able to enjoy the water rides such as this one called the Tornado. 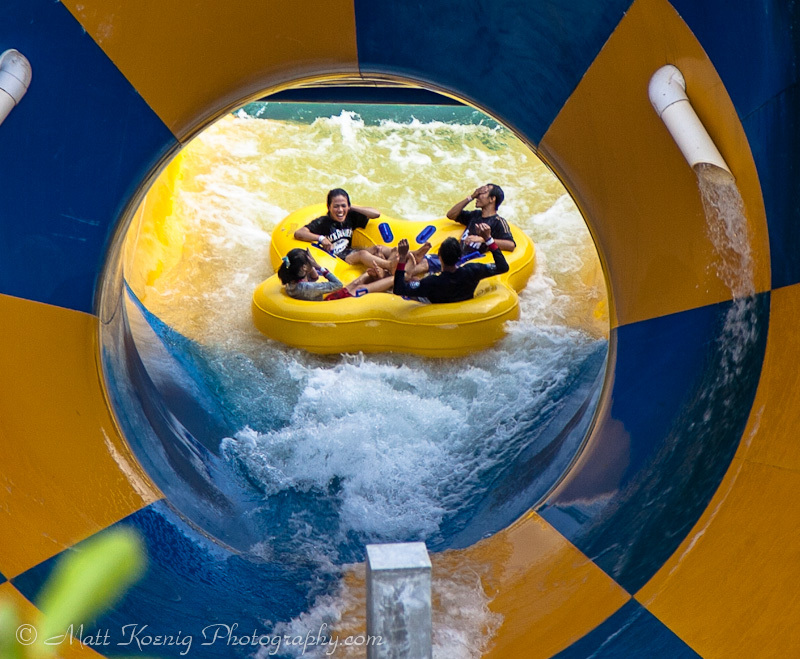 You sit in these rafts and slide down a giant water slide before reaching this tornado where you bounce around from side to side before being flushed out the bottom. Unfortunately, after lunch the rains started as they usually do this time of year in Indonesia. But we made the most of it and still had fun. 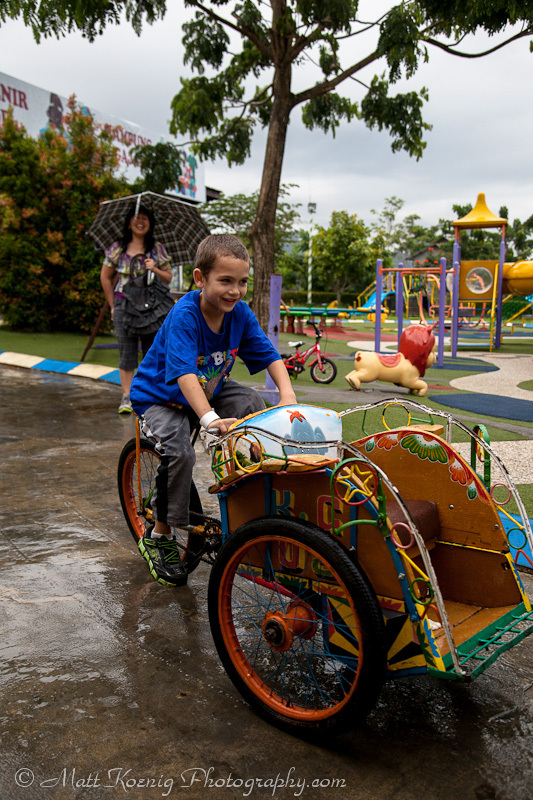 One of the activities that the kids seemed to enjoy the most was driving a becak. They couldn’t get enough of it. 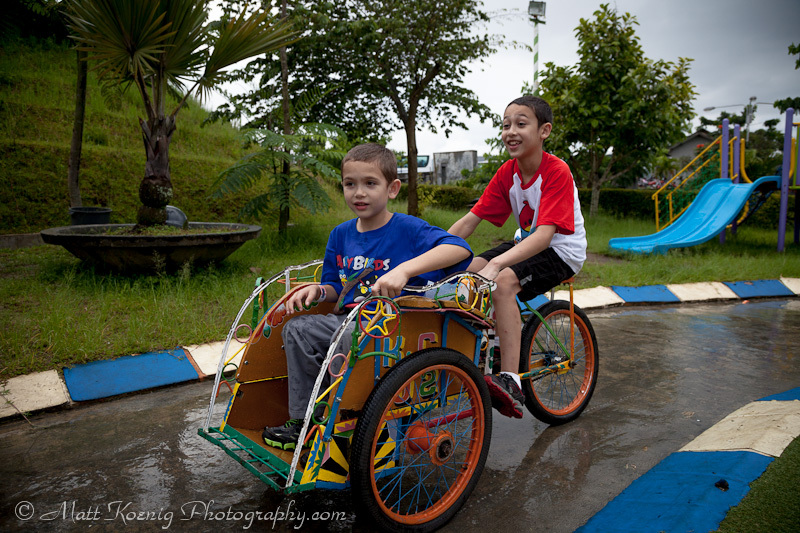 My kids riding around in a becak at Kampung Gajah Wonderland. My youngest driving the becak. It was quite the fun day and the kids really enjoyed all the fun rides. Kampung Gajah has over 20 attractions to enjoy and is relatively inexpensive to take the family to. If you want to see a few more photos from our adventure check out our Flickr album from Kampung Gajah. Great shots. Looks like everyone had a good time. It was great fun! We really enjoyed the day.